You are at:HomeUncategorizedDo you know a child with cancer? Snips and Snails. Andrew is 3. We hate it the most when it touches the ones we love. Possibly even more when the one it touches is a child. Thankfully, there are places like Texas Children’s Cancer Center (TCCC) who work tirelessly to cure this awful disease and bring hope to patients and families daily. Six years ago, I made the decision to quit working at The University of M. D. Anderson Cancer Center (UTMDACC), which is within walking distance from TCCC in the Houston Medical Center, because my oldest son was born. I know the faces of precious little ones with this awful disease all too well. They were beautiful. They were funny. They were sweet. They were kind. When they could, they would smile for you, despite the pain and fatigue that wracked their tiny bodies. Their resolve almost seemed indestructible. ﻿﻿ Like a snowdrop flower. Splashway Waterpark, just outside of Houston (in Sheridan), wants to assist The Snowdrop Foundation TODAY in improving the lives of children with cancer. 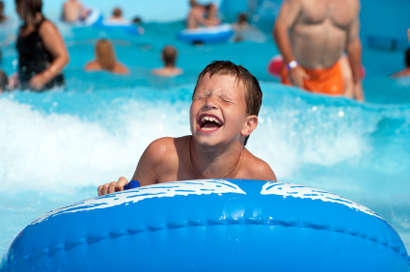 Until midnight tonight, Splashway Waterpark is offering a 50% discount on admission. Admission is typically $20, but can be bought today for only $10. For my fellow Houstonians, you would take I-10 west through Katy to Columbus and make a left on 71. It is located in a perfect spot for a day trip.